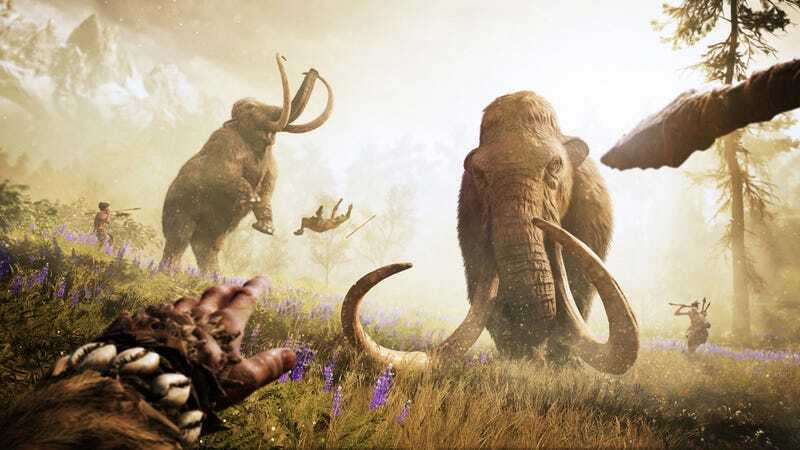 Pop quiz: What makes Far Cry Primal different than all the other games Ubisoft has released over the past year? No, it’s not the mammoths. Not the fake language they made just for this game, either. Give up? The answer: There’s no season pass. It’s 2016, man. Big companies don’t just release games and then supplement them with downloadable content like they did in the old days (2013). Publishers like Ubisoft instead try to sell you DLC before their games actually come out, attaching a flashy optional package called the “season pass” that will let you pre-buy all of a game’s expansions before you even know what they are, or what the game is, or whether any of it is really worth your money. EA’s done it, most notoriously with Star Wars Battlefront. Last year’s Arkham Knight was a very good game marred not just by PC woes but by a notoriously disappointing season pass sold by publisher Warner Bros. Hell, even Nintendo’s doing it these days. So it’s remarkable that Far Cry Primal doesn’t have a season pass. There’s a pre-order bonus, sure—this is Ubisoft we’re talking about!—but nowhere to give money in exchange for future downloadable content. Maybe someone overslept?